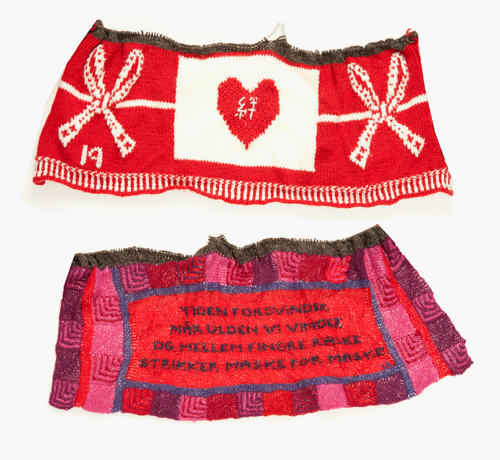 Here are two beautiful examples of the 80 knittings that are included in the monumental piece from the Faroe Islands. They are made by Aqiyo Murono, Japan and Vinca Thile, Denmark. Description of a monumental knitting piece. Agree on a common theme. Sharing a common story raises the value of the event. on the materials and technique. the yarn. Leave the knitting on the needle. Secure the knitting needles with a rubber band. left needle to the neighbour on your left. Start knitting. Your knitting will move to the right. a sample, which shows your own tradition. Produce a happy, crazy red message. Each person was given a small ball of natural, Faroese yarn. The origin of the yarn is part of the story. performance. Duration: Approximately 1 hour.